For many a college student, their first pet is not just a loyal friend, but a symbol of independence and adulthood. As most dorms don't allow animals, the allure of moving out of student housing, or off campus, is strong. While an animal may seem like a good idea at first, they're like buying a plane ticket, meaning that they're loaded with extra charges and hidden fees. Love and affection aren't enough to sustain most animals; you also need to factor in the cost of food, toys, medicine, check-ups, and unexpected costs. In order to choose that perfect first pet, decide on the level of maintenance you can both commit to and can afford. It's harder to keep a dog than a hamster. Obviously. Newborn puppies (and kittens) can be very expensive. 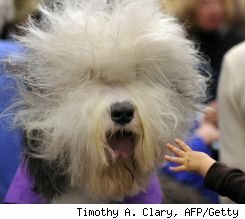 Breeders can charge upwards of $1,000 for a new dog. Prices like that aren't really in the college students' budget. The next option would be looking at a local mall, but horrors of puppy mills can keep you up at night. Short of knowing someone just giving the animal away, what should a savvy student do? Petfinder.com is a great place to start. You can do local searches based on price and breed to help narrow down your quest for the perfect pet. Another good place to look: animalrescue.org. Rescuing pets is the new trend. Not only does it feel good to give an abandoned or unwanted animal a new home, but it's also cheaper than going to a breeder. Everybody wins. So now that you have an animal, how do you take care of it? Dog food runs around $9 to $13 for a 5-pound bag depending on brand; PetCo gives a good list. On top of that, your dog needs toys to keep it occupied and a cage to sleep in. Those will of course vary in price and quantity, depending on the size of your dog. Petstreetmall.com has a good selection of items. You also need to immunize the little guy against all of the doggy diseases out there. Plenty of advice exists regarding how many shots a newborn animal needs. This doesn't take into account yearly checkups, infections, worms or spading. An average examination can be $40 every time and if you're working through school, your copay isn't going to help with that. On top of all of that, dogs need to be walked every day – there go all of your plastic bags – and entertained. What if you don't lock it up when you go to class and you come home to find your couch ripped to shreds? That's another few hours spent searching Craigslist.org for a new one. And you can forget going to Mexico on spring break ... because who's going to take care of the dog? A dog may sound good in theory, but at the risk of sounding like your parents, they're a big responsibility and you have to make sure you're ready for one. If you're looking for something a little more manageable, then mice, gerbils, hamsters and guinea pigs may represent a better choice. They're not as smart as a dog or a cat, but they're still furry, warm and cuddly. They also stay in one location and their cages are usually colorful which can actually help brighten a drab room. Petsmart lists most of their products online and you can see that a hamster cage can be as cheap as $25. All you need are woodchips for lining and pellets for food. You can even save money, by giving it some of the same food you're eating for dinner. Check out this list of common foods hamsters will eat. If you live in a tiny apartment and don't have time to walk it, a pet like this might be more your speed. If you want the novelty of the pet, but none of the effort, then the perfect collegiate companion is the snake. They don't run around and chew on the furniture and they're easy to keep. They live in a terrarium (an aquarium without water), which can be found in any major pet store. They're usually around $50 new, but if you can find one on eBay or Craigslist, they're much cheaper because they don't really have any secondary use. As pet stores don't usually keep exotic species of snakes, they won't cost you that much to purchase. In fact, your only real investment will be in the heat lamp and the electricity bill to keep it turned on. Food isn't really an investment because once the snake is large enough, it'll eat mice – or pinkies as they're called – which cost a dollar a mouse. One rodent can feed your critter for an entire week. That's a lot more cost effective than buying pounds of dog food. While the choice of the pet is up to you, don't fall into the trap of buying a pet out of boredom or novelty. Like children (or maybe your roommates), some will just eat away at your free time and money; others simply sit there and look cool. A dog may make you feel like an adult, but a snake is more practical. You can still feed and fuss over a reptile all you like and it won't wake you up in the middle of the night to go out. Then again: If you;re up at night fretting over an exam and need a warm snuggle, what could possible beat your Best Canine Friend?